How about a short camel ride for about 25 minutes from the dunes in Maspalomas, which is epic and makes you feel like you are in the desert. Discover the dunes of maspalomas from the thrills of riding a camel with your family, friends, partners. During the tour you will be amazed going around the natural reservation. Or maybe you fancy camels a lot well ,we also have a complete organized camel safari adventure, with a complete show and barbecue! with Professional Staff and Guides. 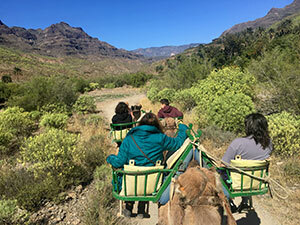 Come and ride us with one of the best Gran Canaria Camel Safari Tours and live an unforgettable experience now ! Copyright © 2017 - 2019 GranCanariaCamelSafari.com is a GranCanariaBoatTrips company.